Remember to be careful with your kitchen drain and be aware of what’s going down there. The kitchen sink is the star of the hardest working room in the house. We use it for almost all of our kitchen activities: we peel the veggies into it, rinse the chicken off in it, and of course wash our pots, plates, and utensils in it. But when we mistreat the kitchen sink, we get back-ups, bad odors, or worse. We tend to think the kitchen sink can handle anything, but there are definitely some things that should never go down the drain. Whether you’re peeling potatoes to boil and mash or chopping up carrots and celery to add to a stew, the veggie scraps should not go down the drain. Those bits and pieces of veggie debris may not seem like a big problem, but they can get trapped together and become a huge clog that becomes a plumbing emergency. This is especially true if you don’t have a garbage disposal, but even if you do, try not to toss this stuff down. The small pieces could be small enough to wash straight through the disposal but still make a big clog later on down the pipe (especially if mixed with some FOG). The best bet for this type of stuff is to compost it or throw it in the trash. Even if you have a garbage disposal, you should never put bones down the drain. Garbage disposals are just not strong enough to deal with them. If they do slip through to the disposal, you’ll know it by the telltale crunch and grinding sounds. This could be a big problem for your disposal, or if they break up enough to go down, they could cause a huge clog and do major damage later. 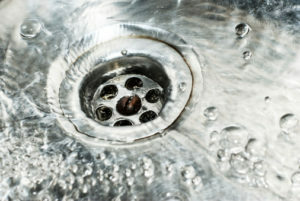 This one is an issue specifically if you do have a garbage disposal. What, but they’re so small? Yes, the tiny coffee grounds can be a big problem if they get caught up in the moving part of the disposal. You’re much better off composting them or tossing them out in the trash. What on Earth is FOG? It stands for Fat, Oils, and Grease and these things can spell disaster in drains. Usually these are poured down the drain while they’re still hot, and therefor runny. But these liquids will solidify as they cool and you don’t want them doing that in your pipes or even out in the city lines. As they do, they usually create huge clogs because they solidify around other things like those veggie scraps. Instead of dumping these down the drain, put them in a container to cool completely and then throw them out in the trash. If you still have more questions regarding the benefits of water softeners, we here at Mahon Plumbing are here to help. We have been serving the wider Baltimore area since 1994, so we have the experience to back up our fantastic service! Call us at our Baltimore location at 410-766-8566 or our Pasadena location at 410-636-7944. Be sure to keep up with us on social media by following us on Facebook or Twitter. This entry was posted on Friday, October 19th, 2018 at 2:15 pm. Both comments and pings are currently closed.